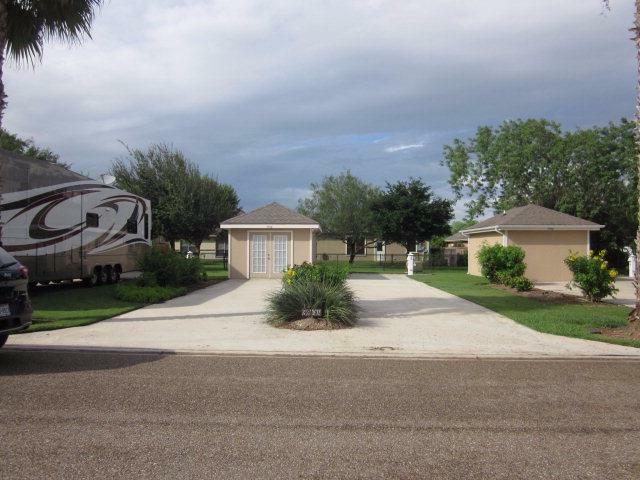 Gorgeous RV lot and coach house is the epitome of Texas rustic casual. Custom wood paneling and cabinets finish the coach house for that casually elegant feel. Complete bath with shower and living space lets you spread out from your RV and have room for guests. Extra large outside storage for your toys/golf cart. New AC in 2017. Lot backs to green space for extra privacy and has plenty of room for your RV and other vehicles. Retama Village is the RGV's premier 55+ community with a beautiful clubhouse, fitness center, dog park, organic garden plots, saltwater pools, craftroom and woodshop. Walking distance to world class birding and butterflies. Landscape maintenance included in HOA fee so all you have to do is enjoy life both here in Retama Village and when you are on the road. Community Amenities Certified 55+ Community Gated Entrance Planned Unit Development (Pud) Pool Privileges Property Owners' Assoc. Listing by Carol Kerr Welch of Encore Fine Properties.